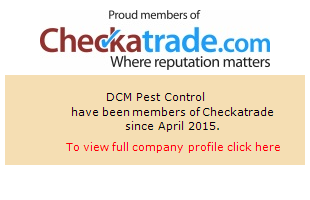 DCM Pest control are one of the leading providers of pest and vermin control in Sussex. We provide our services to both the domestic and commercial sectors including rodent control, insect control and proofing solutions. Sussex pest control only use the traditional trapping method. We believe this is the most humane way of killing a mole and it guarantees removal of the problem. Mole catching is a skilled job and as professionals, we usually catch and dispatch of moles within two visits, but if we need to return in order to rid your pest problem then we will do. You may hear a buzzing in your loft, see wasps in your garden or, if you are unlucky, feel the sting of a wasp. If you have experienced any of the above, then it is time to take action. Locating a wasp or hornet nest is not always an easy task. They hide away in warm and secluded places, often inaccessible and hard to reach. We have the equipment, chemicals and experience needed to destroy a wasp nest fast. At DCM Pest Control, we use two methods of catching rats. The more common method is baiting. We use bromadiolone and brodifacoum based poisons which act as an anticoagulant. Rats are what we call ‘neophobic’, which means they are weary of new objects. For this reason it will take up to a week for the pests to feed on the bait. Rats will need to feed on the poison several times before consuming a lethal dose. This method is chosen as it ensures the rats do not become suspicious of the bait and so the entire colony of rats can be dispatched. We also use mk 4 fenn traps in tunnels and snap break back traps when necessary. Lofts that are within 2-3 metres of tree branches are more likely to get a squirrel pest problem. Also those who make a food source such as bird seed readily available will find they are more likely to attract vermin, which squirrels are classed as. Rotten soffits and fascias are a common entry point for grey squirrels, although these pesky intruders can bite through roofing material, especially if they have been blocked out of the loft and are desperately trying to get back to their young inside. Equally, if you block a hole with the animal inside then they are likely to cause considerable damage trying to escape. Pests can be a nuisance. They can damage your home, spread disease and cause harm to you or your family. DCM Pest Control Sussex take the hassle out of any pest invasion. We are a local business, large enough to provide an efficient and professional service, but small enough to ensure our customer service is friendly and caring. DO YOU NEED HELP WITH A RODENT, INSECT OR PROOFING PROBLEM? At DCM Pest Control Sussex all services are carried out by local professionals. We are a fully insured and accredited pest control company and offer a same day response service. We have set fees for all our services, so there are no hidden costs or nasty surprises. Our staff and friendly and knowledgeable and offer quality service at an affordable price. We offer pest control solutions from treatment and removal, to prevention and elimination. Our experienced and friendly staff can help residential houses and flats, agricultural land, caravan parks, golf courses, warehouses, hotels and other commercial buildings and rural areas. Rats and Mice will often leave what are known as ‘smear marks’ along walls and entry points. This is caused from contact with their greasy fur. Pests will take advantage of any small gaps around your property. This photo shows how mice were gaining access via a faulty air brick. All rodents must gnaw on a daily basis to keep their teeth down. Often they will use water pipes and electrical wiring causing serious damage. Our aim is to provide our customers in East Sussex, West Sussex & Sussex with a quick and effective pest removal service 7 days a week. We work with our clients to ensure any infestation is quickly resolved! Call us to resolve any problems with – rats, mice, wasps, moles, fleas, squirrels and foxes.